Most people who enjoy anime are content to just watch it. But for some, the shows being put out by official production outfits is unsatisfactory. 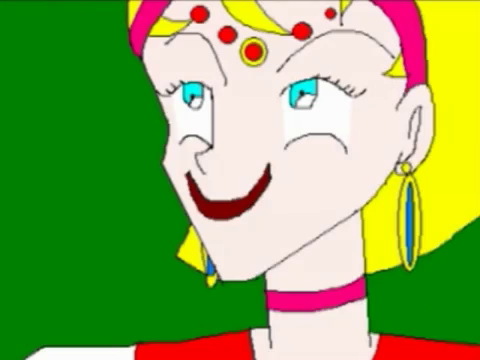 These enterprising individuals, often with nothing but MS Paint and a Youtube account to their name, set out to create their own anime. Known as fanime, these amateur productions prompt questions like “what would anime look like if the fans were in charge,” “what if Sailor Moon took place in Iran,” “exactly how much you can trace before it qualifies as plagiarism,” and, maybe most importantly, “can enthusiasm replace a lack of resources, knowledge, and talent?” No, it can’t. Let me get that out of the way right now. Still, that doesn’t mean there aren’t entertaining fanime out there. Elemental Goddess (or alternatively, according to the writer, “Erementaru Gadesu”) is a Sailor Moon fanwork that takes the basic premise of the original, awkwardly traces over it, and transplants it to the Middle East. The broad strokes are the same – literally, when it comes to the transformation sequences – and I’ll trust that anyone reading an anime site in this day and age is already vaguely familiar with Sailor Moon. There’s also a little bit of Captain Planet, as the original cast of elementally empowered Sailor Scouts is overseen by goddess Mandana… or Mananda, depending on the voice actress. It also inherited Captain Planet’s approach to social issues, on which more shortly. The first episode of Elemental Goddess starts by introducing the villains in the most helpful way possible, with one of them saying “I hate humans, I can’t stand them. My name is Raphael.” This is the most nuanced characterization anyone in the show receives. Rounding out the cast of antagonists are a woman in a latex bodysuit holding a Quran, some kind of tiger centaur, a presumably Japanese woman with a folding fan, and Queen Beryl. Together, they plot to take over Earth. The heroes’ introduction comes in the form of Mandana being mad about having to do laundry, so she kicks the washing machine so hard that it cracks in half and explodes. She and the cast of interchangeable Sailor Scouts then go out to eat, but forget to bring money, and so one of them has to run back to the house they all share. The intense errand action is interrupted by the villains’ plot: to summon a demon who uses her earring as a whip, then leave to hang out in a featureless black void. The Sailor Scouts soundly lose until they realize that wailing on demons with their fists works just as well as magic, and the day is saved. What would be a forgettable fanwork, however, is rescued by the incredible “special episode,” which attempts to tackle the issue of religious conflict in the Middle East. Set between the planned but never-made fourth and fifth episodes, it introduces three new characters: a Jew, a Muslim, and a Christian, each of which is conveniently tattooed with the symbol of her respective faith. Previously friends, the trio were turned against each other by the evil influence of Dark Shadow, a black man in a turban. I won’t dwell on the symbolism of that part, and the show doesn’t either, as it immediately delves into the interfaith conflict. The Sailor Scouts interrupt the group in the middle of a theological argument (littered with such gems as “this prophet you admire so much was actually a Jew” and “Islam equals doom to all”) and find themselves on the receiving end of a laser shuriken shaped like the Star of David. This is the best-animated part of the series, and the most I’ve ever enjoyed a magical girl show. The Christian isn’t too impressed, though, because her response is that “Jewish people have been worthless throughout history.” Black Shadow appears and tries to burn them at the stake, and for good measure the fire is also electrified so that nobody can run through it. This doesn’t stop one of the Sailor Scouts from trying, and eventually succeeding with the power of prayer – not to the goddess she knows personally, but to the nonspecific one true God. She then uses a magical compact to erase everyone’s religious symbols and, I assume, turn them into atheists, so that they can get along again. This is high-concept fanime. I’m not sure how sincere I am at this point, but I was definitely entertained by Elemental Goddess. It’s endearingly bad, which is the best kind. I could go down a laundry list of similar endeavors, most of them worse. I was going to include Tokyo Crystal Mew in this article, for instance, but I couldn’t bring myself to finish the first episode. The opening theme hurt me physically, emotionally, and probably spiritually, so I’m taking that one off the table. Anyone who absolutely must know about animated Tokyo Mew Mew fanfiction can easily find it on Youtube. No, what I want to address is professional fanime, if such a thing is possible. A Summer Day’s Dream, originally titled Touhou Anime Project before series creator Zun forced the change in order to make his non-involvement clear, is an attempt to create a Touhou adaptation that looks and sounds like a proper TV series. To accomplish this, doujin group Maikaze hired big-name voice actresses who starred in shows like K-On and Madoka Magica, as well as animators who don’t work primarily in Flash and MS Paint. In the process, they found out why so many fanime look amateurish: running even a semi-professional studio is expensive, and so only two episodes have been produced in the last six years. 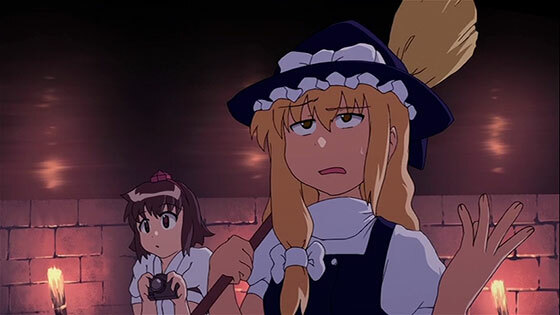 Understandably so, as the plot and gameplay of Touhou is “a shrine maiden and company fight everybody, for any reason, forever,” and making a show that’s 100% action would be beyond even a real studio. So instead Maikaze animated 45-odd minutes of girls drinking tea and misplacing their belongings. Will Reimu ever find her donation box? Will Youmu get her watermelons back? I eagerly await the resolution to these plot threads, due sometime in the 2020s. Good thing Patchouli found her lost book, or this column would be nothing but A Summer Day’s Dream theorycrafting. In all seriousness, I don’t see why the creators had to make the project about Touhou specifically, or why so much effort was invested into it. It really has nothing in common with the source material beyond the characters’ appearances, so they could have gotten the same effect by editing Touhou outfits into Lucky Star footage (and if you think someone on Nicovideo or Youtube hasn’t done that already, you don’t know the Touhou fandom). And even though the production values are the main selling point, the animation still looks like it’s in the same ballpark as Studio DEEN. It edges out the games’ art, but is that really saying much? A scientific estimate yields roughly ten million Touhou fanime projects. I won’t discuss any of those here. In fact, I feel like I’ve lavished too much attention on them as-is, so I’d rather close this by pointing out a couple of good fanime. Not “good” in the sense that they’re fun to laugh at, or good because they succeed in aping mainsteam anime, but good because the creators realized they weren’t going to make the next Dragonball Z or Sailor Moon. The good fanime are the ones where those involved knew their product was going to look amateurish and consequently ran with it, relying on good writing in place of looking impressive. One series I can unreservedly recommend is Senpai Club, an ongoing Swedish-made parody of school anime. It follows a pink-haired schoolgirl as she discovers the eponymous club, whose horribly off-model members have dedicated themselves to avoiding female attention. It’s clever, funny, and unfortunately short enough that I don’t want to say too much for fear of ruining the humor. So instead I’ll move on to Nyan~ Neko Sugar Girls, a magnificent work of absurdism that is the closest anything with a tilde in the title has gotten to qualifying as true art. I will stand by that, by the way. Whereas Senpai Club is a parody of bad anime, Nyan~ Neko Sugar Girls is a parody of fanime. And it parodies the genre by exemplifying and exaggerating everything wrong with it. The intro isn’t merely J-pop, it’s ripped directly from Dance Dance Revolution, complete with in-game announcer. The characters aren’t off-model so much as there was no model to begin with. Not only are there honorifics, they’re also used to refer to everything. The main character is a catgirl who contracts rabies and has to go to the veterinarian. The animation and dialog exist completely independently of each other. The requisite bishonen love interest turns out to be gay. The characters have no idea whether they live in America or Japan. Lines like “I am very arigatoful” abound, and in the finale a doctor determines that one of the characters died of “a broken kokoro.” Nyan~ Neko Sugar Girls knows it’s bad and revels in it. In short, it’s glorious. I said it, I don’t care who knows it, just please check it out for yourself. Peace.